DOHA, Qatar, 2017-Aug-02 — /Travel PR News/ — Qatar Airways is pleased to announce a new codeshare agreement with LATAM Airlines Brazil starting 1 August, which will provide Qatar Airways passengers with connections to 25 cities throughout Brazil. The agreement provides new codeshares on LATAM’s routes between São Paulo’s Guarulhos Airport and 25 domestic cities across Brazil including Rio de Janeiro (GIG), Salvador (SSA), Campo Grande (CGR), Foz do Iguaçu (IGU) and Recife (REC). Qatar Airways began flying to Brazil in 2010 with a service from Doha, Qatar, to São Paulo, Brazil, and onwards to Buenos Aires, Argentina. Over the subsequent seven years, the award-winning airline has continued to strengthen its presence in the region. 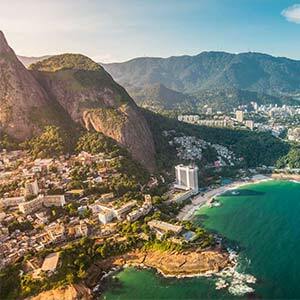 Qatar Airways recently announced it will commence a new service to Rio de Janeiro, Brazil, in 2018. Additionally, Qatar Airways Cargo has also expanded its footprint in South America, with commencement of freighter services to São Paulo, Brazil; Buenos Aires, Argentina; and Quito, Ecuador. Launched in February 2017, the new freighter service aims to meet the region’s growing need for import and export trade with the Middle East and Asia. Part of LATAM Airlines Group and a fellow oneworld member, LATAM Airlines Brazil serves 44 destinations throughout Brazil, including 25 domestic airports from its hub in São Paulo Guarulhos Airport (GRU), offering seamless connections for Qatar Airways passengers travelling from Doha. As oneworld alliance partners, customers of both airlines are ensured recognition of their frequent-flyer status and benefits including access to lounges worldwide, through check-in, extra baggage allowance, plus accrual and redemption of miles, priority check-in and boarding across the carriers’ networks. Celebrating 20 years of Going Places Together, Qatar Airways is one of the fastest-growing airlines operating one of the youngest fleets in the world, with 200 aircraft flying to more than 150 key business and leisure destinations across six continents. The airline recently added Dublin, Republic of Ireland and Skopje to its global network, soon to be followed by Prague, Czech Republic; Sohar, the Sultanate of Oman; and Kyiv, Ukraine. This entry was posted in Airlines, Airports, Business, Flights, Travel, Travel Management, Travelers and tagged Akbar Al Baker, brazil, codeshare agreement, LATAM Airlines, Qatar Airways. Bookmark the permalink.